The U.S. Senate was poised late Wednesday to deal a historic rebuke to Saudi Arabia, a longtime U.S. ally, advancing a resolution to end American support for the kingdom's military intervention in Yemen's civil war. The Republican-led chamber voted 60-39 to begin debate on the measure, acting in defiance of the Trump administration, which had strenuously argued against a rupture of cooperation between Washington and Riyadh. "There needs to be an end to U.S. complicity in the ongoing bombing of civilians and the killing of children (in Yemen), in effect, war crimes," Connecticut Democratic Sen. Richard Blumenthal told VOA. "This resolution says that in this terrible, horrific war that Congress is prepared to act, and I hope very much that all of us will seize this opportunity," Independent Sen. Bernie Sanders of Vermont, who co-authored the measure, said. Underpinning the resolution is an assertion of Congress' constitutional duty to declare war and approve U.S. military missions. The U.S. legislature has not authorized America's support role in Saudi Arabia's campaign to combat Iranian-backed Yemeni rebels, a conflict that has led to widespread civilian deaths and stands as one of the world's worst humanitarian catastrophes. But some argued that, in this instance, the case for asserting war powers authority is weak. Senate Majority Leader Mitch McConnell, R-Ky., joined at left by Sen. Roy Blunt, R-Mo., speaks after a strategy session, at the Capitol in Washington, Dec. 11, 2018. "The United States is not involved in combat (in Yemen). It is not dropping ordinance. 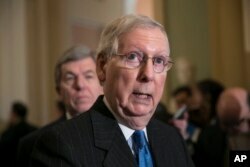 It is no longer even providing air-to-air refueling (for Saudi warplanes)," Republican Majority Leader Mitch McConnell of Kentucky said. "If the Senate wants to pick a constitutional fight with the executive branch over war powers, I would advise my colleagues to pick a better case." Top Trump administration officials have argued that the conflict in Yemen would be even deadlier without the involvement of the United States, which has helped Saudi Arabia identify bombing targets. McConnell echoed the argument. "This resolution would threaten other support the U.S. is providing that is designed to improve coalition targeting and to limit civilian casualties," the majority leader said. Floor debate continued into the evening Wednesday ahead of a final vote. A handful of Republican senators were expected to join Democrats in ultimately passing the resolution. Congressional ire toward Saudi Arabia had been simmering for years as Yemen's civil war dragged on with ever-higher civilian death tolls. Anger spiked after dissident Saudi journalist Jamal Khashoggi was killed at the kingdom's consulate in Turkey two months ago. U.S. Secretary of State Mike Pompeo speaks to reporters, Dec. 12, 2018, at United Nations headquarters. 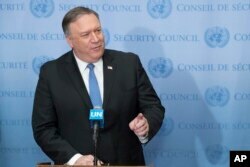 Speaking at the United Nations on Wednesday, Secretary of State Mike Pompeo noted that the Trump administration already has sanctioned "a large number of persons who were responsible for the heinous murder of Jamal Khashoggi," adding, "(W)e will continue to investigate and take the facts where they lead and get to a place where we hold those responsible accountable." But Pompeo stressed that "America's interests in the region are important, and our partnership with the Kingdom of Saudi Arabia is an important one. It has delivered American security in important ways in President Trump's first two years in office, and we intend to continue to work with the Kingdom of Saudi Arabia to keep America safe." Trump has said that responsibility for Khashoggi's death remains an open question, and noted Riyadh's repeated denials that the kingdom's crown prince, Mohammed bin Salman, played a role. CIA Director Gina Haspel testifies at her Senate Intelligence Committee confirmation hearing on Capitol Hill in Washington, May 9, 2018. The Senate took up the Yemen resolution hours after CIA Director Gina Haspel briefed leaders of the House of Representatives on the agency's conclusions about the Khashoggi killing. 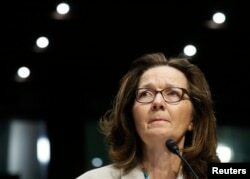 Haspel similarly briefed key senators last week, after which lawmakers of both parties said they were convinced MBS ordered the journalist's grisly demise. While the Senate resolution, if approved, would send a strong signal of displeasure to Saudi Arabia, it is likely to stand as a largely symbolic gesture for now. Swift House action became less likely after the chamber advanced a rule blocking a vote on any war powers resolution relating to Yemen for the remainder of the current Congress. Senators of both parties have said they expect further consideration of Saudi Arabia-related measures when the new Congress is sworn in at the beginning of next year.